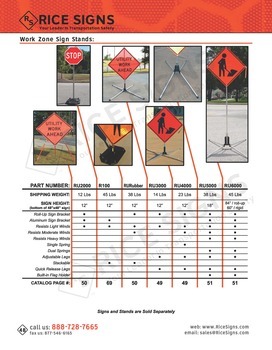 Works with both roll-up signs and aluminum signs. 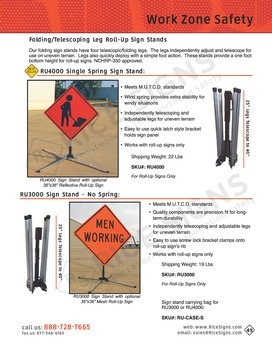 Mounting heights: 7 ft for roll-up signs and 5 ft for aluminum signs. 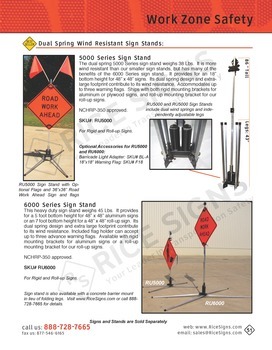 See Heavy Duty Dual Spring Wind Resistant Sign Stand for Roll-Up and Aluminum Signs in our catalog on page 51. Our heavy duty dual spring sign stand provides a 5 foot bottom for aluminum signs, and a 7 foot bottom height for roll-up signs. Its large footprint and dual springs provide excellent wind resistance. Accommodates up to three warning flags. 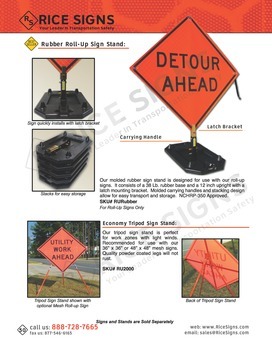 Ships with mounting brackets for both aluminum and roll-up signs.